Tales of Mommyhood: siblings and age gaps - is there a perfect one? siblings and age gaps - is there a perfect one? I often hear people pose the question "what is the perfect age gap between kids?" Personally, I don't think there is a perfect gap. I really, truly believe that everything depends on the personalities of your children. With my oldest, he was wonderful, he was special, but he was demanding. He was a baby that cried a lot, and needed his mama A LOT (not daddy, not grandma, Mommy only for the most part). It was tiring, and while I enjoyed it - I knew that given his personality, and the fact that my pregnancies are difficult, I couldn't have handled being pregnant when he was 2 yrs old. I always wanted my kids to be 2 school grades apart, but that just was not going to happen. He was almost 2.5 when I got pregnant with Kyle, and was 3yrs 2 mths when Kyle was born. I figured this would be good - more independent, not quite as stuck on mommy. But, I was wrong. When Kyle was born, Julien had a very rough time adjusting. 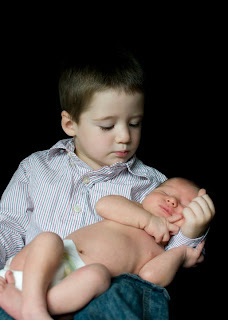 The first 2 weeks were great, he loved to hold/cuddle/kiss his brother. If he was crying, Julien would grab the soother and shove (yes, I do mean shove) it into Kyle's mouth. Then reality set in and Julien realized that it wasn't very fun to listen to a baby cry (although K was not a crying baby, it was pretty rare at that point). Now that Kyle is 17/18 mths, and Julien is 4.5 - things haven't changed all that much. Kyle wants SO SO SO badly to play with his big brother, but Jules gets frustrated because Kyle just pretty much wrecks everything that Julien is doing. We do have times where they can play together for a few minutes; and my heart just melts when I hear them giggling together. But, I really do long for the day where I can leave them in a room together for a few minutes and come back to no one crying (although, given that I have 2 boys, I am not sure that will ever happen). So, do you think there is a perfect age gap between siblings? Let me know how far apart your kids are and how well they get along. Great question! I had my 2nd when my son was almost 6 and it was great because he was ready for a sibling and truly had enjoyed his time as the only child. I got pregnant with my youngest when my middle child was 2 and it was very rough on him at first. I think it was easier on him because I had a little girl, but he had about a month period where he acted out and reverted to some babyish behavior (all totally normal, of course). My oldest is 10 now and is a huge help with both his siblings but he is such a protector of his little sister that it warms my heart every time I see them together! I think it depends on the kids. I was scared to have only a 22 month difference between children but it worked out very well for us. I think it helped that Tessa (the older one) still nursed, though it might just be her personality. Now (at 3 and 17 months), they play well together, they fight over toys but spend a lot more time being silly and happy together. My girls are 6 years apart and it's worked wonderfully. My oldest is indepedent, caring and a bit more understanding of her toddler sister. They play and get along well and my oldest has been very helpful. Our next one is going to be quite a few years apart too. :D I think every situation is different just as kids are different. I agree with you. There is no prefect age gap. It all depends on the personality of the child. I was 8 years apart from my sister and it was rough for me. I reacted like Julien.